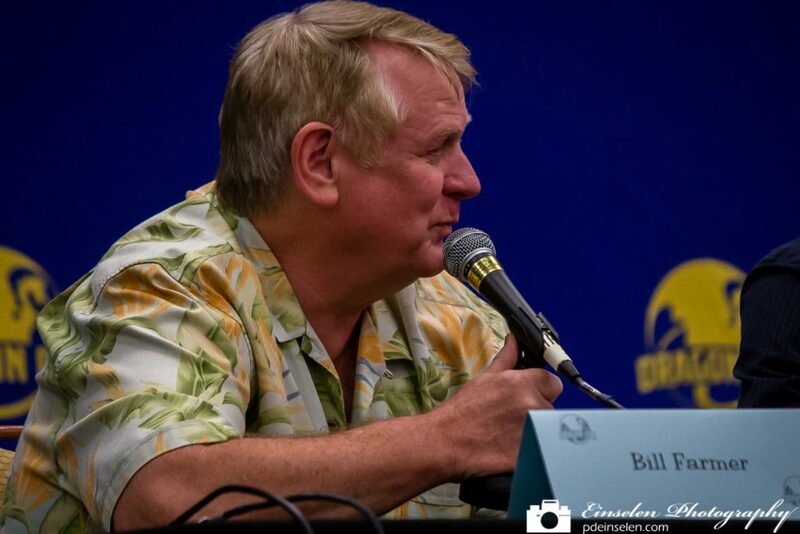 Bill Farmer was an Ask a Character panelists at Dragon Con. During the panel the moderator and audience members asked questions in which the panelists would respond in the voice of their character(s). Other panelists included Sam Marin, Carey S. Means, Mark Meer and Rob Paulsen. Bill Farmer is best know as the voice of Disney’s Goofy since 1987. He is also the current voice of Pluto and Horace Horsecollar. Other significant characters he has played include Yosemite Sam, Sylvester, and Foghorn Leghorn in the movie Space Jam (1996). He has also done several guest voices, both on TV, including The Grim Adventures of Billy & Mandy and in video games, including the Destroy All Humans! series, Namco’s Tales of Symphonia, where he voiced Governor-General Dorr, in Square Enix’s Kingdom Hearts series reprising the role of Goofy, Detective Date in the SEGA game Yakuza, Captain Wedgewood and Frill Lizard in Ty the Tasmanian Tiger, many voices on EverQuest II, Cletus Samson, Floyd Sanders, Jeff Meyers and Ryan LaRosa in the video game Dead Rising and Sam and others in the cult classic adventure game Sam & Max Hit the Road. Note: This post is part of a series of photos from Dragon Con. Dragon Con is a North America multigenre convention, founded in 1987, which takes place once each year in Atlanta, Georgia. For more information about Dragon Con visit http://www.dragoncon.org.